a while back i talked about the best waffle in the world, the liege waffle from bruges, here in downtown salt lake. my whole family became obsessed, and one by one, when each would visit, i would take them and share with them this glory. i took my dad for his birthday when he was in town last september and they had fresh seasonal peaches from the farmers market across the street as a topping option. best. thing. ever. and let me tell you, my dad is the last stop in the family when it comes to a food critic. if he loves something, you KNOW it's legit. so, lo and behold he searched on the internet to find a recipe for my mom to replicate. and a place to buy the sugar pearls that go in these little delights. he sent me this recipe and found one place in utah that sells the sugar pearls. they don't even have them by where they live so i am in charge of getting them their supply. like a dealer of sorts. so this recipe. it's good. but it's not as good as bruges. it's a little thicker and breadier and waaay more buttery (while that's usually a good thing, it wasn't AS good as it could be in this case). also, it takes some serious time to make these. but when you don't live within a few miles of the original, they would most definitely be worth it. especially if you froze peaches from last summer and made créme fraiche to top them with. allow eggs and sparkling water to come up to room temperature first. melt the butter over hot water or in the microwave then allow to cool to lukewarm. sift the flour and salt into a bowl, then make a well in the middle. beat the eggs in another bowl, then add butter whisking to combine. sprinkle yeast over the top and whisk well. then add the sparkling water and whisk again. add the entire mixture to the flour along with the granulated sugar and vanilla extract. beat the dough for at least ten minutes. it will start out kind curdled looking, but will stiffen and become a slightly sticky brioche-ish type dough. cover with plastic wrap and let rise in a warm place for 60 – 90 minutes. begin heating the waffle iron and knead the pearl sugar into the dough. drop by heaping 1/4th cup onto each quarter or section of the waffle iron and bake until well browned. serve warm and top with whatever goodness you like. (avoid too many too sweet toppings like nutella + créme fraiche + peaches unless you want a bellyache like my good friend, tan, experienced). its the closest thing to bruges that i have had... but his still beat all. those frittes are amazing as well. isn't it amazing my dad found that? i know you can buy it online, but the shipping is as much as the actual sugar. ang, love that you love that place! your little ones are adorable! OH my gosh, I love those leige waffles and because they taste so good, it makes me have a serious crush on the owner. Serious. 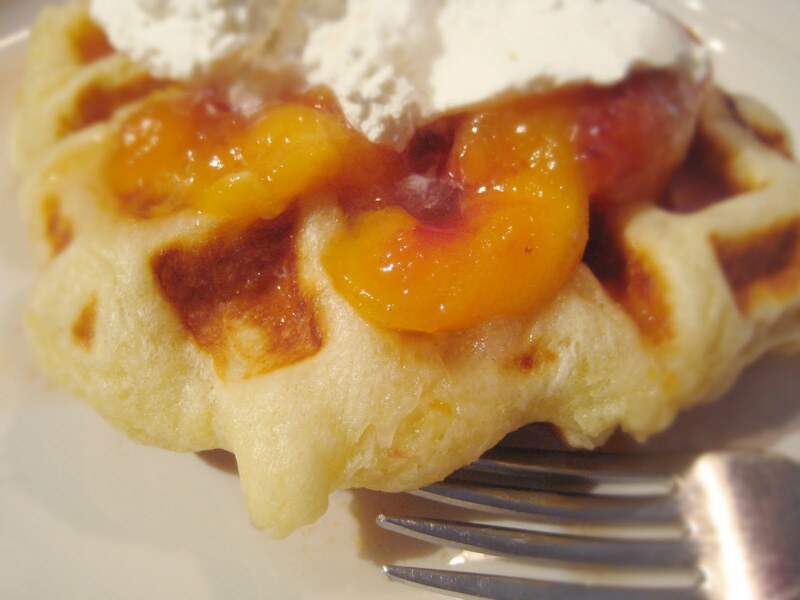 We had some similar waffles in Seattle and immediately went home to try the recipe ourselves. To. Die. For. Especially tasty topped with savory things like brie and basil. And, i get my pearl sugar and vanilla sugar at Ikea! whoa. that sounds amazing. i'll check surfas here and see if they have tha pearl sugar. then i'm on it. Pirate O's in Draper carries pearl sugar! They also have a ton of other fun imported food and drink.